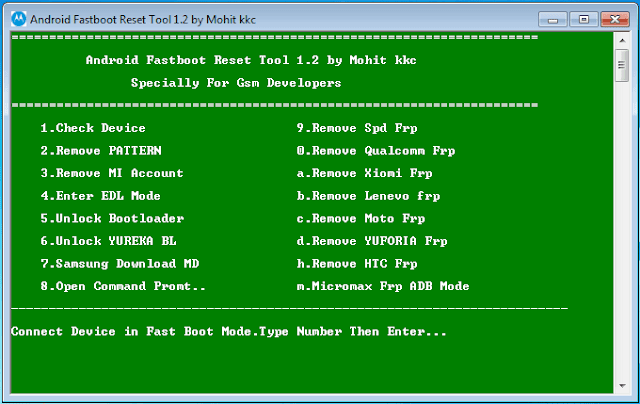 Android Fastboot FRP Reset tool is a very small Computer tool which can help you to remove various FRP lock . Android FastBoot Reset Tool updated version is released and is ready for direct download for our site . Using this software you can remove Android FRP without any premium box. This tool works on many android devices to remove FRP but some of the models will not shown here. Tags: Symphony FRP remove tool,Samsung FRP remove tool,Sony FRP remove tool,Lava FRP remove tool,Micromax FRP remove tool,MI FRP remove tool,HTC FRP remove tool,Xioami FRP remove tool,Android Fastboot FRP Reset Tool ,Android Fastboot FRP Reset Tool download,Android Fastboot FRP Reset Tool free download,Android Fastboot Reset Tool V1.2,Android Fastboot Reset Tool download,How to remove frp lock,Google FRP unlock tool,android FRP unlock tool download,Oppo frp unlock tool,Android Fastboot Reset Tool V1.3 free download,Remove SPD Frp lock,Remove MTK frp ,MI Account remover ,Android Fastboot Reset Tool,Android Fastboot Reset Tool without password,Android Fastboot Reset Tool needrombd,Samsung Download mode,android frp lock unlock tool for free,FRP,Android FRP,What is FRP ? ,FRP Tool.